Do you have a missing tooth or teeth? Dental implants are one of the most reliable and accessible options; they have a 98% success rate and even if you do have complications for some reason, they’re typically minor and can be corrected quite easily. Sugar Fix has been doing dental implants in Chicago for years, and we think there’s no better option to address a missing tooth. Some people feel nervous about the procedure because they see the photo of the screw implanted into the gum tissue and jawbone and think it will be very painful. However, many of our patients are surprised by how simple the process is and how little pain they feel both during and after the procedure. We want to share a little more information on dental implants with you in case this is something you are considering! Dental implants are very safe, but still some people worry about the procedure. Dentists who perform this procedure are highly trained, and have lots of experience with dental implants. They know the exact placement and can handle any variable to ensure a successful and complication-free procedure. Dr. Jessica Emery is an expert and she will take the time to get to know you during your consultation. She’ll let you know if you’re a good candidate for a dental implant, and talk through the entire procedure with you beforehand. She’ll do everything she can to make sure you have a positive experience, but it’s important to keep in mind that aftercare is also a big part of the equation. It’s up to you to follow her instructions before, during, and after so you can be one of the 98% of patients who have a great experience! Nervous? Go for Sedation Dentistry! We generally use some anesthesia during the procedure so you don’t feel any discomfort, but we suggest sedation dentistry to those feeling especially anxious. At Sugar Fix Dental Loft, we offer conscious sedation, which means Dr. Emery will prescribe you a medication like Valium or Diazepam to take the evening before your visit and the morning of your appointment. This FDA-approved prescription works well for the majority of our patients and allows them to get through the procedure with ease! There will be discomfort as you heal from your procedure, but ice packs, saltwater soaks, and over-the-counter pain relievers can be a huge help as you recover. After the procedure, you will want to pay close attention to the area and continue to practice good oral health. We have found that those who have complications after their dental implant do so because they have failed to care for their oral health. Just like any other tooth, a dental implant will not thrive in a mouth that isn’t properly cared for. 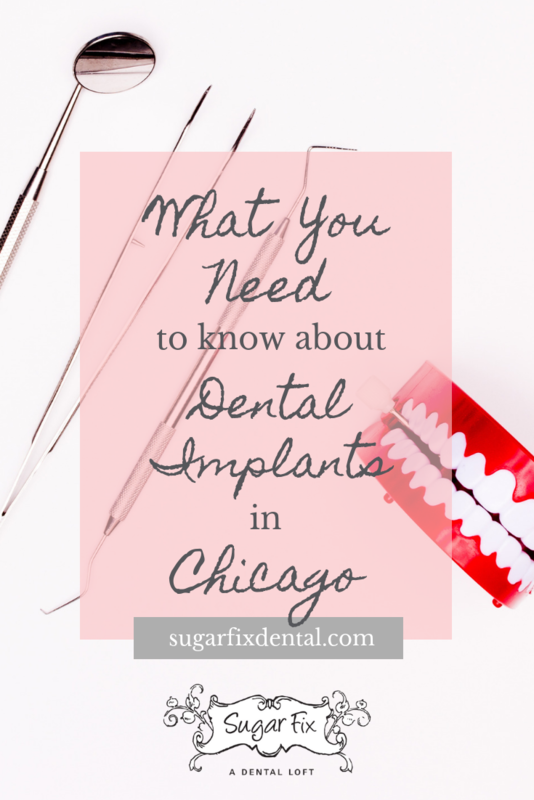 Are you looking to get a dental implant in Chicago? We’d love to help you get the smile you’ve been dreaming about. Give the Sugar Fix team a call at 773-883-1818 or schedule your free consultation right on our website!